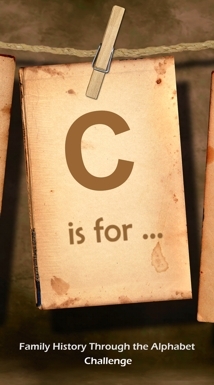 Continuing on with Alona’s Family History Through the Alphabet Challenge brings us to the letter C.
Lots of possible C words: Cornwall, Culley, Children to name but a few so maybe I’ll mix all of these into this story. My Mary Johanna Nicholls emigrated to Queensland in 1884. She married William George Weeks 14 May 1884. The family story was that she had come to Queensland in a bid to improve her health. She died of tuberculosis in 1886. They had one child Rupert George Weeks. This very nice marriage notice was in the Brisbane paper and this and the marriage certificate led me to Mabe in Cornwall (incidentally the Stoke in Devon turned out eventually to be Stoke Damerel, one of the three cities of Plymouth). Mary was born 8 September 1859 in Mabe Cornwall and baptised 5 July 1862, the same day as her younger sister, in Stithians, a next door parish. Her parents were Richard Nicholls and Mary Ann Culley as shown by her birth certificate. Their marriage certificate is below. All is well and the next logical step is to look for Mary Ann’s baptism which should be 1828 or before. I check the 1851 census and it states that she is born in Mabe. In the 1851 census for Mabe there was the below entry for a John Culley, stonemason. Not proof, particularly with a name like John, but interesting. So a search of the Mabe baptism registers (which incidentally you can do online now with the digital images on the FamilySearch site which is a lot easier than the evenings I spent at the Family History Library at Kangaroo Point going through the microfilms. The online images are not as yet indexed but they are way-pointed so it is just like scrolling through microfilm but in the comfort of your own home). However there is no baptism for Mary Ann Culley. So I do a search of adjacent parishes, still no baptism for Mary Ann Culley. Mary Ann Nicholls was very consistent about where she was born in the ensuing censuses. Interestingly there were no baptisms for anyone named Culley even though John Culley also said he was born in Mabe as were his children. there was this baptism shown below. On further searching I found a baptism for each of John Culley’s children under the name of Cullicoat, Cullecoat, Callicoat. So we have a John Culleycoat who is a stonemason whose wife happened to be Jane Winn on further research. Sampson Winn Culley marries in 1862. When researching we all know that consistent spelling is a fairly recent idea as literacy levels varied and accents caused issues. Even today consistency can vary, I have received mail addressed to Hellen, Helan and Helon as well as the usual Helen and even Smith can have a few variations. This change of surname seems a bit way out and I have no explanation as to why pretty well all the Cullicoat family changed their surname to Culley between 1841 and 1851. John’s father James is buried as a Cullicoat in 1842. Was there some major scandal (I haven’t been able to find anything in the British newspaper Archive) but there has to be some reason why John and his family and his brother James and his family all changed their names. Hmm, not quite Saturday but my writing is done when I can find some time. A slightly perplexed moan here: I have put some photos up on Ancestry to share and while I don’t mind people copying them (after all that was why I put them there). I still don’t understand why those same people don’t contact me and ignore me when I contact them. Do they seriously believe that is all the information I have on that person or family? William PHILPOTT born in 1838 in Cheriton, Kent marries Sarah MORGAN born in Llansafried, Wales. Well we assume they marry somewhere around 1858 as their first child was born in July 1859 in Folkestone, Kent. They go on to have another 12 children in Saltwood and Hythe (two of the other supposed children were actually her daughters’ children). William dies 3 Military Terrace, Hythe in 1898. Sarah dies there in 1912. Per the 1911 census where it asks ‘how long have you been married in your current marriage’ Sarah says “37 years” which would make a supposed year of marriage 1874 (Sarah signs the form, so possibly it is the truth or they never married). William does die in 1898 so it would also depend if Sarah still considered herself married or not in 1911 (my mother still considers herself married even though Dad died seven years ago) in which case the marriage may have been 50 years previously eg 1861 if my maths is right? William was employed as a groom in his early days so it is possible that they met while he was in service., as it is interesting that they come from different sides of the country. I would love some fresh eyes on this as I have looked for this marriage for a number of years. I did a search from 1858 to 1898 which is when William died. It is possible that Sarah was previously married which would muddy the waters somewhat. Unfortunately Philpott, while not Smith is still not an uncommon name, especially when you add in a possible marriage anywhere in the country or even possibly out of it!